The first Riverside Police Cruiser was a 1965 Chevrolet received in January 1965 from Lewis Chevrolet for the cost of $2,125.00; other bids were Danville Studebaker, $2150.00, and Lawrence-Horton Ford, $2,129.60. September 1967, a 1968 Chevrolet from Hawkins Chevrolet for $1,425.00 plus trade. One other bid for $1,481.20 plus trade was received from Lawrence-Horton Ford. September 1969, the cruiser was a 1970 Ford for $1,205.21 with trade. Heritage Motors bid $1,590.00 with trade for Plymouth and Hawkins Chevrolet $1,387.00 with trade. It was decided to purchase air conditioning for the cruiser bringing the total cost to $1,639.21. November 1970, a 1971 Plymouth Fury was purchased from BZ Motors of Lewisburg for $1,840.00 plus trade in. Higher bids were Triangle Motors, $2,500.00 and Hawkins Chevrolet, $2,290.00, both included trade in of old cruiser. February 1974, bought a 1974 police cruiser (unknown model) on State buying program for $3,639.68. November 1976, one bid from Hawkins Chevrolet for a Chevrolet Nova, $4,800.00 with an AM\FM radio. March 1980, one bid received from Hawkins Chevrolet for a Chevrolet Malibu at the cost of $7,100.00, without trade. The 1977 Chevrolet Nova kept as second cruiser. December 1983, three bids received: Hawkins Chevrolet, $10,650.00 for a Chevrolet Impala; Metzer Ford (2 bids) $10,254.00 for a Ford LTD and $10,379.00 for a Ford Crown Victoria. The Borough chose the Ford Crown Victoria. February 1987, one bid received from Hawkins Chevrolet for a Chevrolet Caprice, $13,210.00. January 1990, a 1990 Chevrolet Caprice from Hawkins Chevrolet for $14,296.83 over Metzer Ford, $14,498.00. In November 1992, Boro chose a 1993 Ford Crown Victoria from Metzer Ford for $13,610.00 over a Chevrolet from Hawkins: $16,543.63. 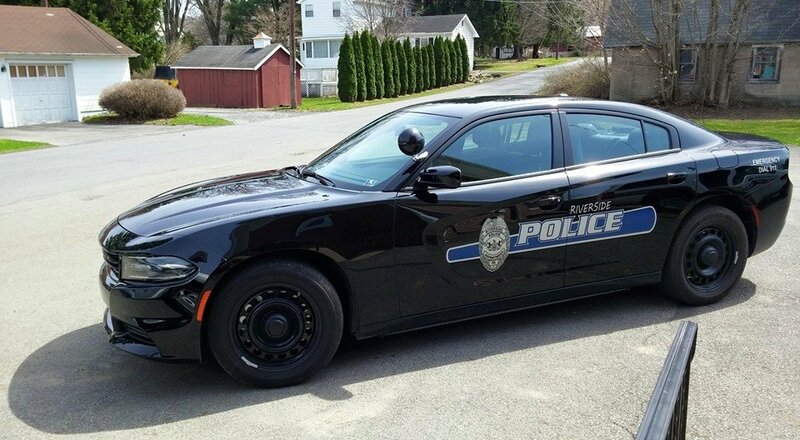 1987 Chevrolet Caprice used by Borough Manager. October 1994, a 1995 Ford Crown Victoria from Metzer Ford at $18,420.00, Hawkins Chevrolet, Caprice $19,360.00, trade in 1987 Chevrolet Caprice; 1990 Chevrolet Caprice used by Borough Manager. October 1997, Hawkins Chevrolet was the only bid received, a Chevrolet Lumina, V6, for $21,185.00, and trade in the 1990 Chevrolet Caprice. The Lumina was the main cruiser in use and the 1993 Ford Crown Victoria was the unmarked cruiser. The 1995 Crown Victoria is used by Borough Manager. On April 23rd, 2001 the Borough placed into service a 2001 Ford Crown Victoria police cruiser from the State piggy back purchasing program. This allows boroughs and townships to be able to purchase equipment through the Commonwealth of Pennsylvania at bulk purchase discounts. The vehicle cost was $19,881.48 including the Chevrolet Lumina as a trade in. 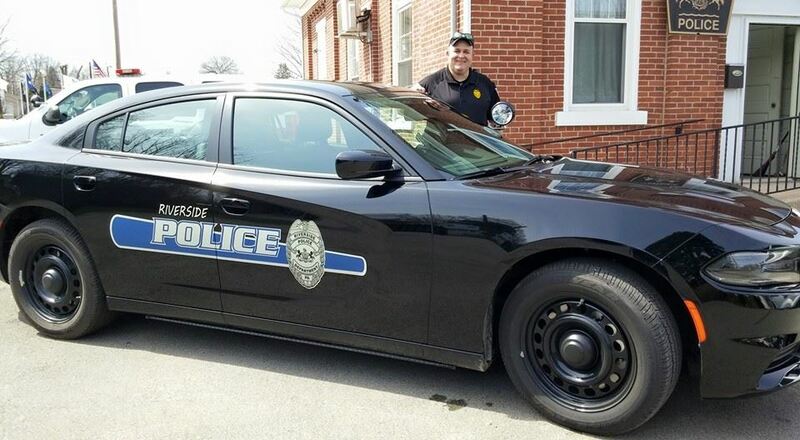 On April 13, 2015, a new Dodge Charger was placed into service at the Riverside Borough Police Department. The vehicle was purchased from Zimmerman Dodge for a cost of $26,148.00. It will be outfitted with Police Lights, Cage, etc and the Decal applied and designed by Adam Gregg.